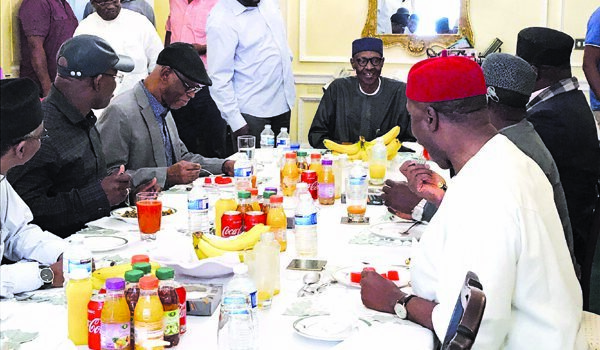 Okorocha led some All Progressives Congress (APC) governors in company with National Chairman John Odigie-Oyegun on a vist to London to see President Buhari, who is on medical vacation. Yesterday, President Muhammadu Buhari laughed at lies on his state of health, Imo State Governor Rochas Okorocha said after a meeting in London. Those on the trip are: Minister of Transportation Rotimi Amaechi, Governors Umaru Tanko Al-Makura (Nasarawa); Nasir El-Rufai (Kaduna); and Yahaya Bello (Kogi). Acting President Yemi Osinbajo told said that the President is recuperating fast after visiting him on July 11. Presidential Spokesman Femi Adesina last night made available the photograph of the London parley. He also issued a statement: “In a telephone conversation following the meeting of All Progressives Congress (APC) governors and leaders with President Muhammadu Buhari in London Sunday, Governor Rochas Okorocha of Imo State, said the President was very cheerful and has not lost any bit of his sense of humour. “When asked to react to all the negative things being said about him, the President just laughed, describing such negative reports as lies. Governor Okorocha said President Buhari was completely unperturbed by the cocktail of lies. He, instead, sent his best wishes to Nigerians. “According to the governor, Nigerians don’t have to worry at all, adding that President Buhari will be back as soon as the doctors give him the green light. “By our visit to London today, the merchants of lies have been put out of business and Nigerians will not buy the garbage they have been selling. All those who look up to fake news can find better use for their time,” Okorocha noted.